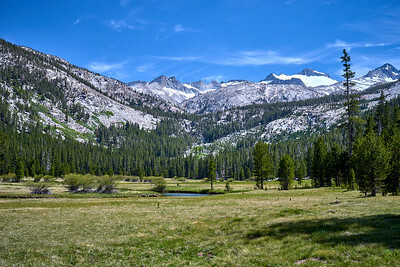 Photos from backpacking the John Muir Trail, starting in Tuolumne Meadows, Yosemite National Park, and ending in Reds Meadow near Mammoth, California. A map of all photos is at the end of the page. 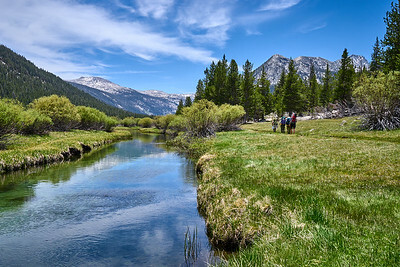 The Lyell Fork of the Tuolumne River has an amazing emerald green color the entire way through Lyell Canyon, with the occasional deep swimming hole to cool off. Mile 26. 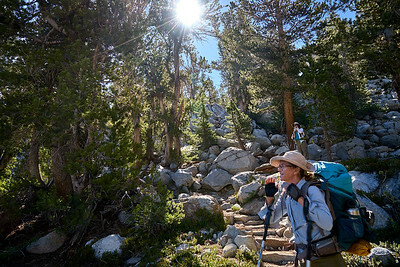 The John Muir Trail/Pacific Crest Trail follows the Lyell Fork through most of Lyell Canyon. Mile 28. 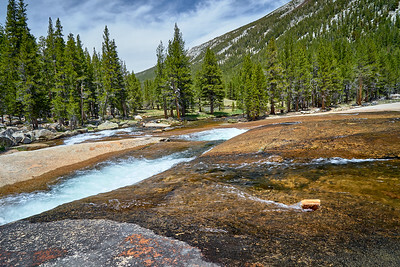 At some points along the Lyell Fork, the river takes a break from it's course through the meadow to cascade down granite slabs. Mile 29. 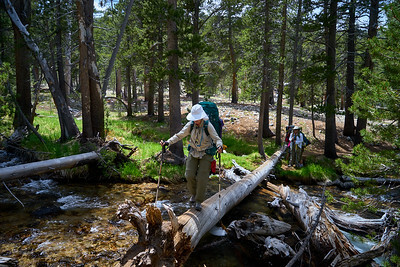 Many stream/river crossings on the John Muir Trail can be made with dry feet, if you find the right place to cross and don't fall! Mile 30. 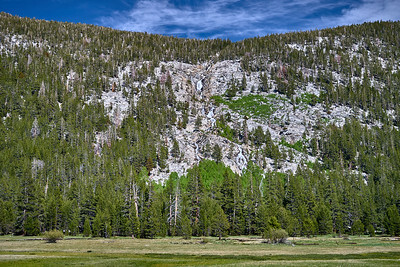 Fallen trees in Lyell Canyon, looking south through the meadow. Mile 31. 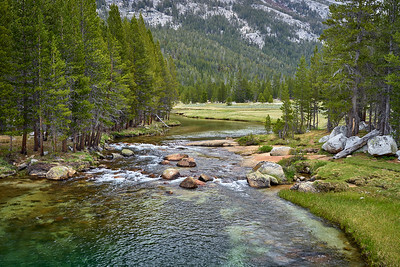 The clear waters of the Lyell Fork of the Tuolumne River look extremely inviting for a dip! Mile 32. 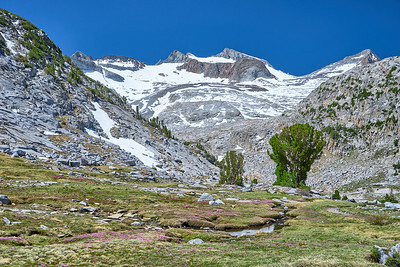 Donahue Peak towering over Lyell Canyon and the Lyell Fork of the Tuolumne River. Mile 32. 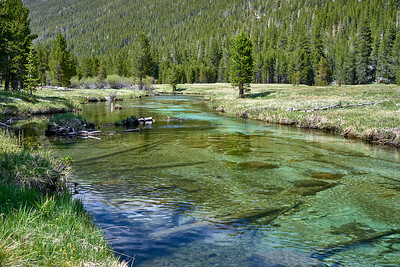 Kuna Creek originates near Kuna Peak and flows three miles down the mountain ending in Kuna Falls in Lyell Canyon. Mile 33. Don't forget to look back! 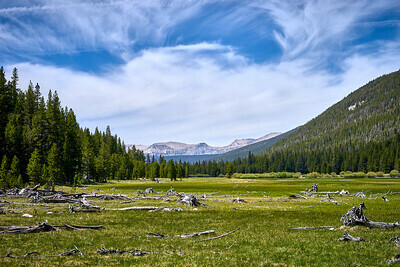 Hiking up Lyell Canyon yields views of the meadow you just hiked through a few miles ago. Mile 34. 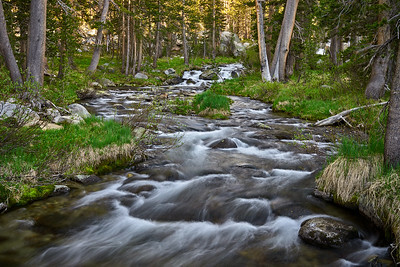 Maclure Creek is a great camping spot to recharge before climbing Donahue Pass the following day. Mile 34. Navigating the switchbacks towards Donahue Pass near Maclure Creek. Mile 35. 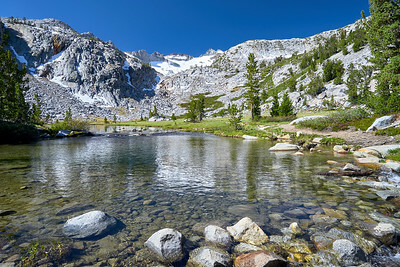 A small lake on the climb up Donahue Pass. It had to be crossed on the rocks in the picture foreground. Lyell Glacier in the background. Mile 35. 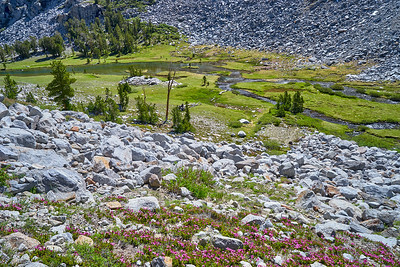 Red Mountain Heather on the slopes of the trail heading up to Donahue Pass. Mile 35. 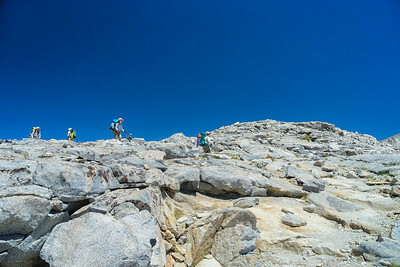 Hiking up Donahue Pass below Lyell Glacier. Mile 35. 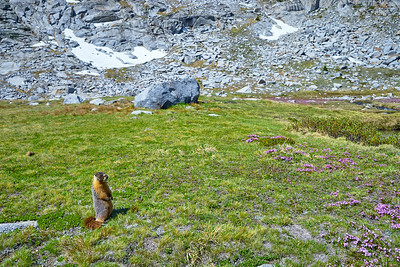 One of Yosemite's infamous Marmots posing near the Red Mountain Heather. Mile 35. 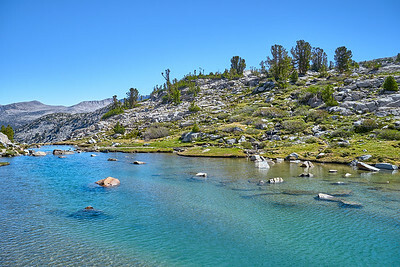 The clean, aqua, glacial waters below Mount Lyell. Mile 35. 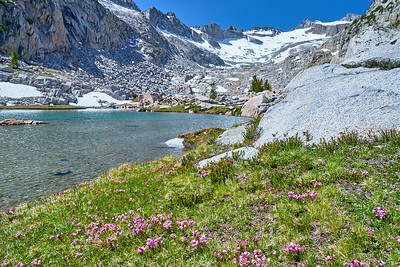 Lyell Glacier is the background for this small glacial lake below Donahue Pass, with color added by Red Mountain Heather. Mile 35. 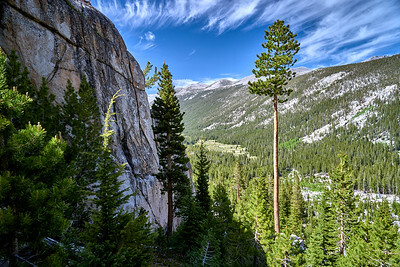 Mount Lyell is the highest peak in Yosemite National Park at 13,114'. Mile 36. 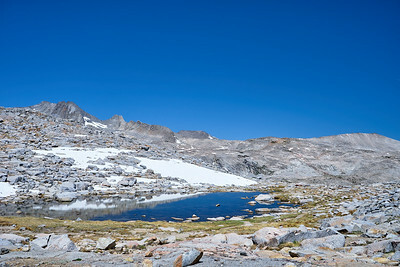 A seasonal pond on top of Donahue Pass. Mile 36. 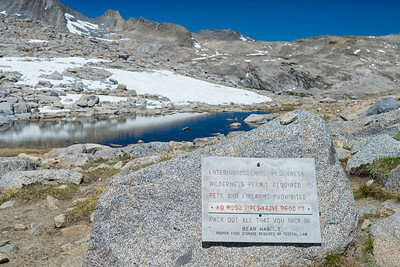 The sign on this rock on top of Donahue Pass signals the end of our time in Yosemite National Park, and now entering the Ansel Adams Wilderness. Mile 36. 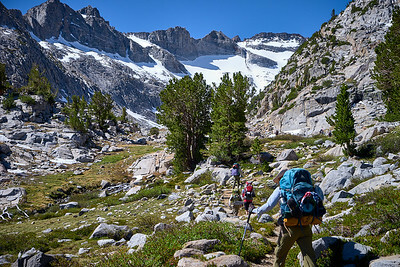 Starting the descent down Donahue Pass. Mile 37. 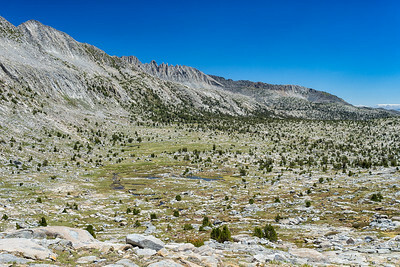 Small lakes and rivers dot the valley below Donahue Peak, fed by snow on the peak itself. Mile 37. 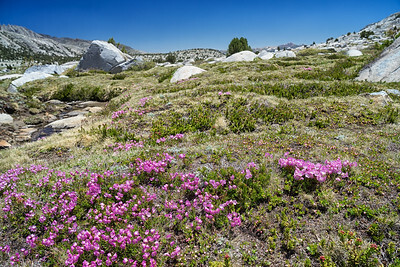 Red Mountain Heather in the meadow on the east side of Donahue Pass, headed towards Rush Creek. Mile 37. 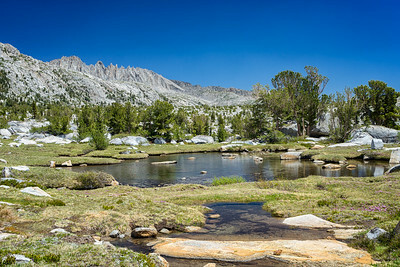 Small ponds on the east side of Donahue Pass. Mile 38.